Theresa's Mixed Nuts: Wow Worthy Desserts Made Effortlessly With Simply Sweets Colorcakes! Wow Worthy Desserts Made Effortlessly With Simply Sweets Colorcakes! *Disclosure- I received the above mentioned product courtesy of the sponsor for the purpose of this review. No monetary compensation was provided. All opinions are genuine, based on my experience with the product, and have not been influenced by promotional items. This post contains affiliate links. Please see my policy tab for more information. The weather is starting to warm up (finally! ), and that means party season is right around the corner. Graduations, weddings and summer holidays mean lots of gatherings with family and friends. Sharing the company of our loved ones always makes for special times, and making sure everyone has a great and memorable time is what makes the party a success. But let's be honest here. As much as we all love spending time together, we all know that parties are all about the food! Every host wants to have an appealing set up of food everyone will love, then make a splash with their desserts as the grand finale! I do love to make all of my own desserts, but sometimes I am rushed and want to whip up something that still looks spectacular when I am running short on time. When I heard about Simply Sweet's first cookbook, Colorcakes, I knew it was a book I had to have! Colorcakes is a 256 page cookbook with 125 easy to follow dessert recipes that anyone can make. Not only are the recipes easy to follow and prepare, they will wow your crowd and have them asking, "How did you do that?!" Most of the recipes are created to look fabulous without putting a lot of time or effort into them, with some only taking 15 minutes to toss together! Colorcakes is full of desserts that will satisfy any sweet tooth. Cake Pops, cookies, cupcakes and popsicles are just a few of the recipe options. Each recipe is accompanied by beautiful, colorful photos of the finished creations. Flipping through the book, I had a difficult time deciding what to make first. Everything looked wonderful. Since I already had the ingredients on hand, I decided to whip up some of the Banana Split Cupcakes. Preheat to 350 degrees. Place a mini paper baking cup in each of 24 muffin cups. In large bowl, beat cake mix, bananas, vegetable oil, 1/4 cup water, and eggs at low speed with an electric mixer for 30 seconds. Beat at medium speed for 2 minutes. Spoon batter into cups, filling 2/3 full. Cover and refrigerate remaining batter until ready to bake. Bake at 350 degrees for 12 to 15 minutes or until a wooden pick inserted in center of cupcakes comes out clean. Cool in pan on wire racks for 5 minutes; remove from pans to wire racks. Cool completely (30 minutes). Repeat with remaining batter to make 24 more cupcakes. In small, microwave safe bowl, reserve 1/4 cup of the chocolate frosting. Insert a large star tip into a large decorating bag; fill with remaining chocolate frosting. Pipe frosting onto 16 cupcakes. Repeat with white and strawberry frosting. Microwave reserved chocolate frosting on HIGH 20 to 25 seconds, or until smooth. Cool 1 minute; drizzle over frosting on each cupcake. Pipe a dab of white frosting on each; top each with sprinkles and a cherry. The mini cupcakes were a huge hit with my girls, and we will be making them again at our first summer gathering. This is one of 125 recipes the book has to offer! 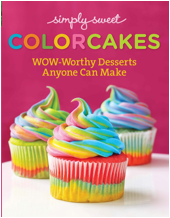 Simply Sweet ColorCakes: Wow-Worthy Desserts Anyone Can Make was released on 4/18/2014, and is now available for purchase on Amazon. Parties are all about the food? So they're not about me when I turn old come June 14? Really? How depressing. Now I need a colorcakeand two banana split cupcakes. I know, I'm on a diet. Banana Split Cupcakes? Well you had me at cupcake, but the banana split part is totally an added bonus! sounds like true cake heaven! Everything does look good. 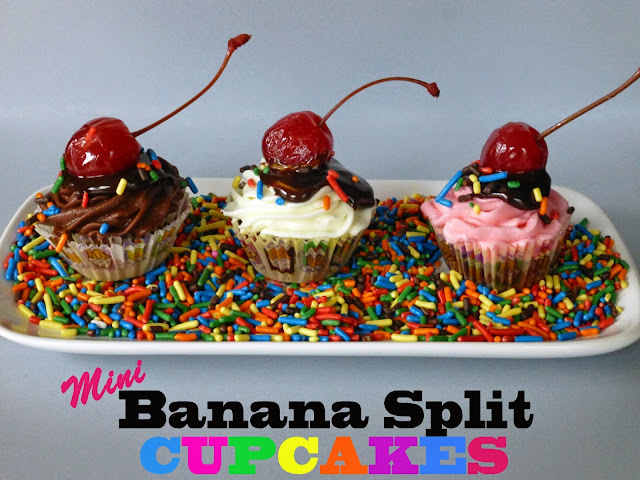 I bet banana split cupcakes are preeeeeeeeeeeeeetty tasty! Wow pretty pretty like a rainbow. Yes. They all look fabulous, but I'm sure I could figure out a way to mess them up in my kitchen. I don't think I've ever seen a prettier cookbook. I'm sure it all tastes divine too. I love cupcakes and they are far superior to cake! I actually had to bake some for my sisters b-day two days ago. I realized why I prefer to make cupcakes instead of cake. You can't sneak a piece of birthday cake when it's all done, sitting there, taunting you, but with a cupcake, you can easily have a taste test or three. And that is a true story of why cupcakes are better! I like the 2nd image. How cute the cupcakes are! These are all so pretty. I have a sensitivity to food coloring, so some of the more colorful ones make me queasy! All of these desserts look so festive and tasty. I'll have to check out all the recipes. Well, how cute are those!!! I'm all about baking and making cute desserts. If I can do it in less time and with less energy, I'm interested! Such a fun cookbook! I love to try different desserts. This looks great. I must have this. This cookbook looks so fun! I love how cute everything is as well as totally tasty! Banana split cupcakes.....is that even legal? LOL Soooooo adorable and yum. Those banana split cupcakes are adorable! Such a cute idea. I would totally make this for a playdate or after school treat for my little one. What fun ideas! I want to make the banana split cupcakes. How fun! I love the banana split cupcakes! I would eat each and every one of those desserts. Cupcakes are my favorite! Those cupcakes are too cute! all of those treats looks so tasty! I need to stop trolling food posts this late at night! Now I NEED a cupcake! The banana split cupcakes look amazing. What an awesome idea for a party! They all sound great! my Mom would love a banana split cupcake! So pretty. I love posts like this that just make me want to go make some cupcakes. these are beautiful desserts. I need to remember to check otu that book! How pretty! I love all the festive colors! I am a terrible baker! I need to buy Colorcake so my poor kiddos aren't deprived of sweet treats. Looks like an awesome cookbook. How beautiful everything is! They look so inviting and appetizing with the vibrant colors. Those are fantastic. I love the colors, my son would die to eat one of those! What fun desserts. I always love food that is just as fun to look at as it is to eat. The pictures are just amazing! Colorcakes does sound a very promising book name, yummy. And your cupcakes are so yummylicious! Amazing! You're giving me some ideas for my daughters birthday coming up in July!